Filed to: opa!Filed to: opa! Anyone who’s imbibed a glass of ouzo—the licorice-flavored spirit that is practically the national drink of Greece—may be familiar with how it turns cloudy when the liquor is mixed with water. But there are still some mysteries about how such mixed liquids behave. 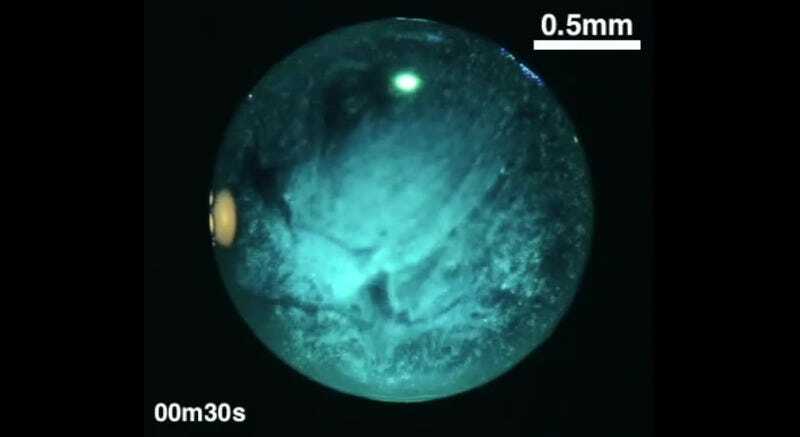 Now physicists at the University of Twente in the Netherlands have captured the various life phases of an evaporating drop of ouzo on camera. They describe their work in a new paper in the Proceedings of the National Academy of Sciences. The so-called “ouzo effect” is a well-known phenomenon, among mixologists as well as physicists. It’s what happens when you add water to ouzo (a mix of water, alcohol, and anise oil) or other liquors that contain anise—notably pastis, raki, arak, sambuca, and absinthe. The spirit takes on a milky appearance. This happens because adding water alters the alcohol-to-water ratio, a key factor in in determining the beverage’s oil solubility. Remember the adage about how oil and water don’t mix? Oil is hydrophobic, so water repels the anise oil. So if you decrease the solubility, instead of dissolving into the ouzo, tiny anise oil droplets start to form, desperate to avoid contact with all that icky water. These in turn form larger micro-dropets. The milky appearance is due to how light scatters off those microdroplets. Lohse and his colleagues identified four distinct stages to the evaporation process. At first the drop of ouzo is clear; the ethanol has just begun to evaporate, and it starts at the droplet’s edges. As the concentration of alcohol decreases in proportion to the water and oil, the mechanism behind the ouzo effect kicks in: micro droplets start to form in the second phase. Then a ring of oil starts to form around the droplet, and the latter starts to shrink. Eventually it gets so tiny that it evaporates completely. Why should you care? Well, it’s wicked cool, for starters. How many of us ever stop to think about the amazing processes that happen on the micro scale when we spill drops of ouzo on the table? Also, understanding how these kinds of liquid mixtures behave—especially how they evaporate—is of great interest to folks in industry, medicine, or technology, not to mention anyone keen on the chemistry of cocktails. And that’s always cause for a celebratory toast.